Government employees and contractors who provide operational support and maintenance for Navy aircraft programs can expect to see their budgets slashed by as much as 25 percent in March, unless Congress stops automatic defense cuts and passes a budget. Garry Newton, Deputy Commander of Naval Air Systems Command (NAVAIR), said his office expects to see a 25 percent cut in Operations and Maintenance Navy (O&M,N) funds if Congress fails to pass an updated defense budget and the first round of automatic “sequestration” cuts hits, as scheduled, March 1. 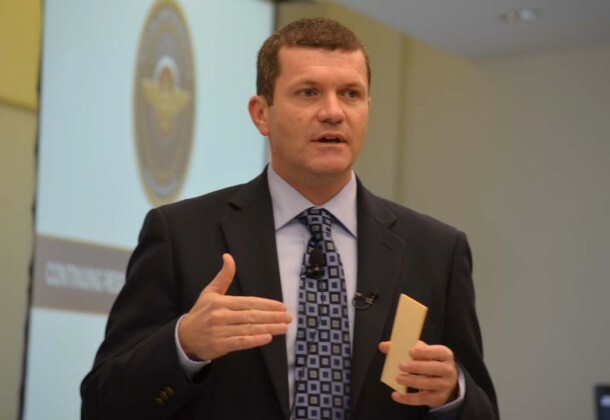 Mr. Newton and other NAVAIR leaders held several industry day forums across the nation Thursday to warn contractors of what they could expect. Mr. Newton said the Navy expected to have $49 billion in O&M,N funds in fiscal 2013. It could end up with $40 billion. NAVAIR was anticipating $3.3 billion and may only get $2.6 billion. However, what would have been a 21 percent cut now keeps growing by the day as the Navy continues to spend money at fiscal 2012 levels, waiting for Congress to pass a defense spending bill. Congress passed a continuing resolution in the first days of January that delayed implementing a new budget until March 27 and pushed back the date of sequestration cuts to March 1. NAVAIR is currently spending money that it will have to make up for when sequestration and a new budget take effect. When that happens, budgets will feel something closer to a 25 percent cut to make up for first quarter spending. The Navy has already delayed the deployment of the USS Truman carrier strike group and held off on refueling the reactor on the USS Lincoln. NAVAIR is currently contemplating ending all depot-level aircraft maintenance for the third and fourth quarter of fiscal 2013, Newton said. The command is also not approving any new research and development testing programs, even as several small unmanned aircraft and special operations projects are about to lose their wartime funding. The command has still not made an official determination on whether it will begin furloughs for civilian government workers, Newton emphasized several times. “It’s easy to talk about what the pricing would be; it’s hard to figure out how that would be implemented,” Mr. Newton said, noting that it would also affect base commanders, who have to provide security and runway maintenance. He also reiterated that the government would only furlough its employees. It’s up to contractors to furlough their own. “This is a political problem that requires a political solution,” said Adelle Pierce, owner and President of AM Pierce & Associates, who introduced Newton to the audience. She thanked NAVAIR for being transparent with its industry partners. “The impacts are going to be huge, and I really don’t buy the line that ‘we’ll wait to see what happens,'” said Joe Anderson, a TPP board member who is helping a non-profit coalition prepare for sequestration impacts. Mr. Anderson’s comments echo that of economist Anirban Basu, who told the St. Mary’s County Chamber of Commerce Wednesday that coming defense cuts would be difficult for the county. As NAVAIR briefed the Partnership gathering, Congressman Steny Hoyer stood at the podium on the House floor and urged Congress to fix the fiscal situation.